The Buckels-blade, also called the old German table knife, is characterized by its tasks: cutting and brushing. 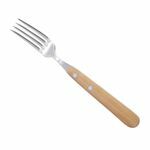 The rounded tip and wide shape facilitate the thin spreading of butter while providing a safe and good cut. The sharp thin section does not only cut bread rolls with ease, but also saves the change to another blade for stronger materials. The "glazing" describes a machining process by which a very homogeneous surface is achieved on the blade. The difference to simpler knives - which appear unclean and coarse due to visible grind marks - is that the blade offers considerably less attack points and therefore a higher corrosion protection. 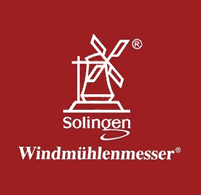 In contrast to most of today's knives, windmill knives are still manufactured with the principle of the "Solingen dry-fine grinding". The blade angle is set high above, whereby the blade runs slantingly and pointedly towards the cutting edge. The result is particularly evident in the high sharpness and edge retention. This traditional type of cut is rarely practiced even in Solingen, but the high appreciation of Solinger knives all over the world is justified. Originated from a rural German tradition, this knife with its special blade shape has been produced unchanged for more than 140 years. A suitable all-purpose knife for kitchen and breakfast table.